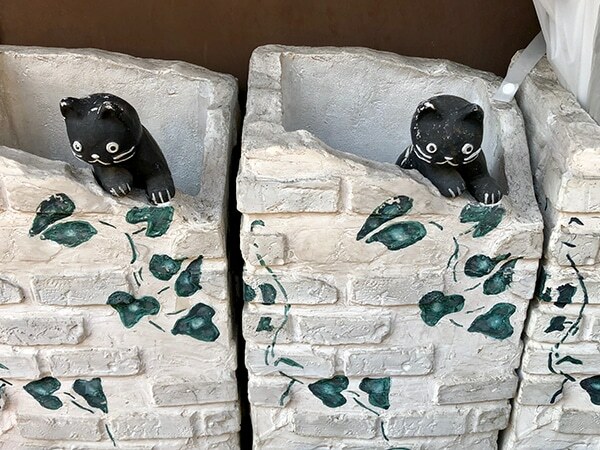 Located a stone’s throw from the hustle and bustle of Eitai Street in Monzen-nakacho, Botan is a quiet residential area redolent of old town Koto-ku. Perhaps because it’s bounded on three sides by water and the Furuishiba Water Park to the south, Botan has the feel of a pleasant but rather sleepy island. 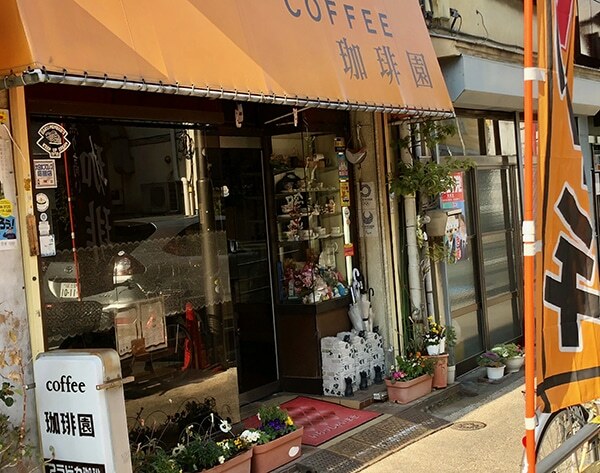 In recent years, it has welcomed a smattering of new shops, cafes, and restaurants yet the venerable Japanese-style cafe (or kissaten) Kohien continues to attract a stream of customers. On a recent sunny afternoon, we popped in for a late lunch and a chat. On entering Kohien, one’s eye is immediately drawn to the enormous number of flowers inside. 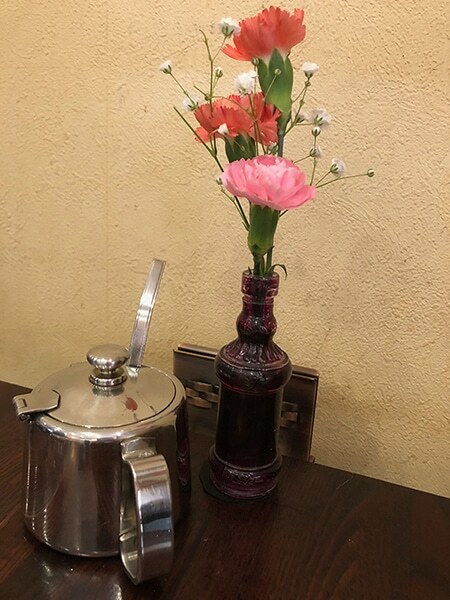 Each table has a small bouquet, while the counter, the walls, and seemingly every available surface, is covered with flowers. “I buy them fresh every day,” says Mrs. Saito, the proprietor. “Of course, they last a bit longer in winter, but to me a place without flowers feels lacking in colour and a bit sad.” Quite when she finds time to buy flowers is another question, given the extremely hard work she and her husband, Mr. Sadanobu Saito, put into running the place. 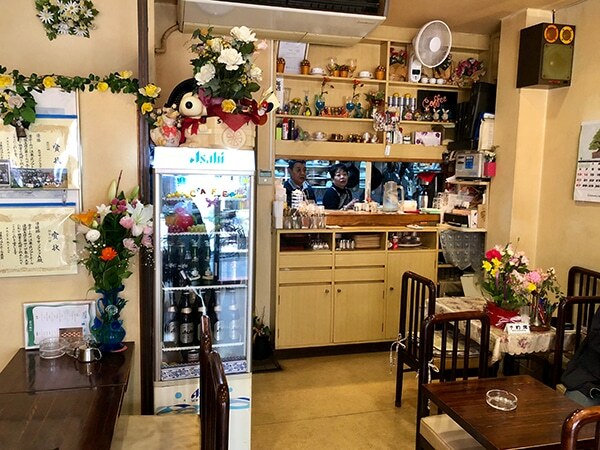 “I opened the cafe 42 years ago, when I was 22, “says Mr. Saito, “and we’ve been running it together since we got married”. The Saitos start early every day as Kohien opens for breakfast at 7am. “Morning sets” are available until 11:00 am and what incredible value they are: ham, egg, toast, salad, and coffee for 550 yen! That’s the A set; B set is the same but with a fried egg and no ham for 50 yen less. 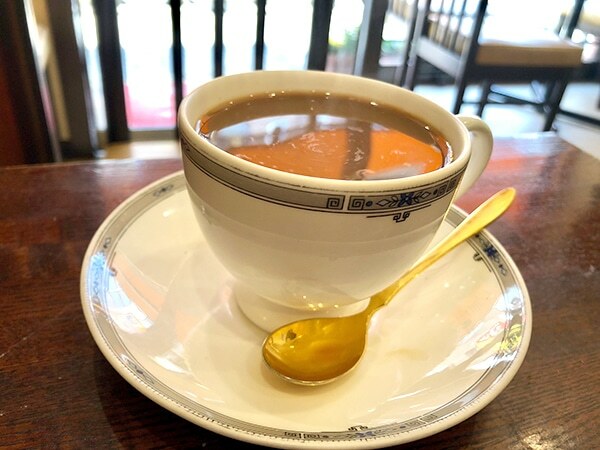 Now, bear in mind that a cup of the excellent coffee costs 400 yen when ordered individually and you’ll see what great value Kohien provides. 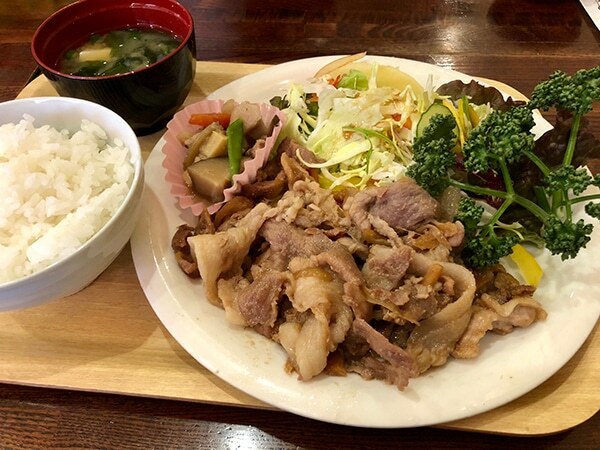 Also, the set meals (teishoku) can be ordered at any time of the day. If the breakfasts sound like good value, then the lunch sets are out of this world. 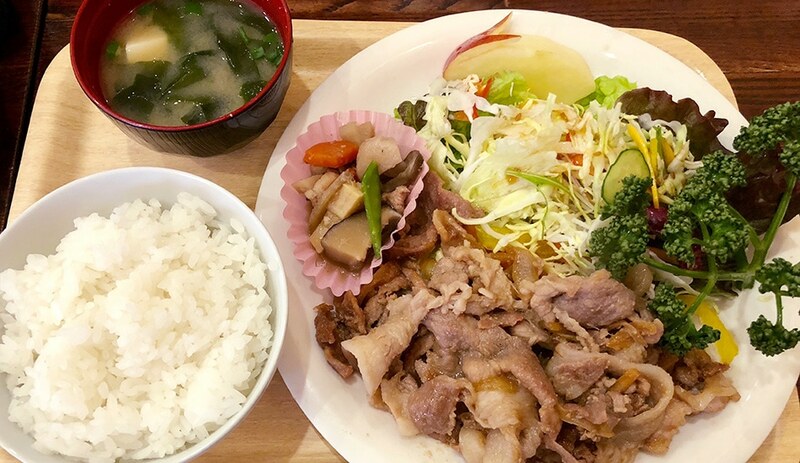 For the princely sum of 800 yen, one can have the top-selling pork and ginger set (shogayaki) which features a hearty serving of pork, simmered vegetables (nimono), salad, soup, a massive serving of rice, orange fruit jelly, and coffee. Remarkable, and all prepared by the fair hands of Mrs. Saito, who cooks everything. 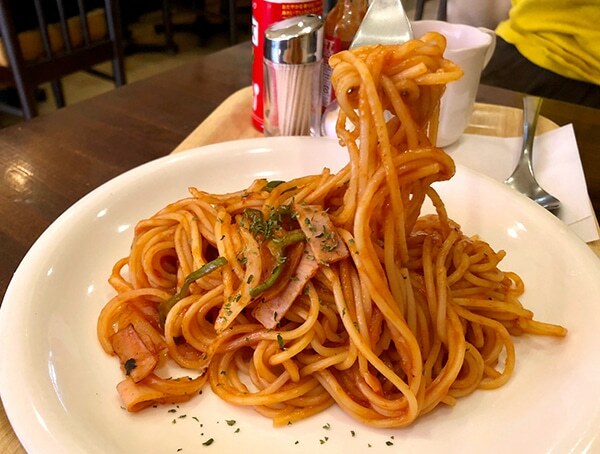 No self-respecting Japanese-style cafe would be without Napolitan spaghetti on its menu. This perennial favourite of bacon, green peppers, onions, and mushrooms in a thick tomato sauce is a Showa Period classic and still very popular at Kohien. 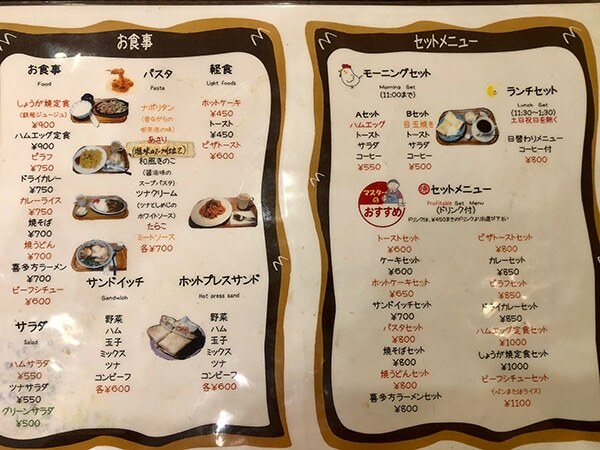 The lunch sets change daily and feature such popular items as curry rice, omelettes, shumai, croquettes, and even Kitakata ramen from Fukushima. 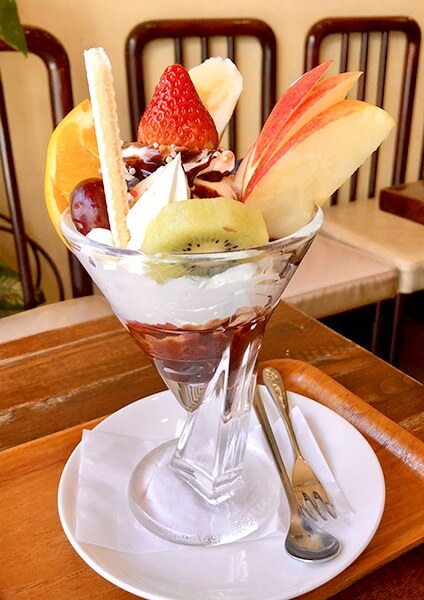 If you still have room to spare for a spot of dessert, then how about one of these spectacular ice cream parfaits. 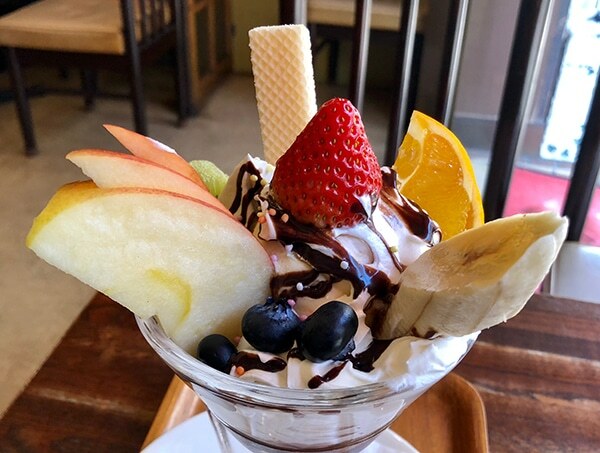 A selection of fresh fruit, cream, ice cream, and chocolate sauce for the unbeatable price of 700 yen. You could even share one with a friend, if you were so inclined. Doesn’t that look great! I can assure readers that it tastes even better than it looks, a rich chocolate, cream, and fruit dream that took two of us more than a few minutes to demolish. There’s no hurry with this one! Since office workers from nearby companies comprise the bulk of Kohien’s clientele at lunchtimes, the hour from twelve to one is busy. Never fear though, as the Saitos’ expert preparation, honed over the years, means that customers can be served extremely quickly. At weekends, local families are strongly represented and Kohien is often crowded, particularly at brunch time. Mr. Saito is a well-known pillar of the local community. Born and bred in Fukagawa, he is a member of the volunteer fire brigade, the Fukagawa Hachimangu summer festival staff, and a representative of the local residents’ association. “Our most popular items are the pork and ginger, coffee, the parfaits, and our special water,” he says. This special water is a brand of alkaline ionized water unavailable elsewhere; recent studies have shown that it may have health benefits for people who have high blood pressure, diabetes, and high cholesterol. 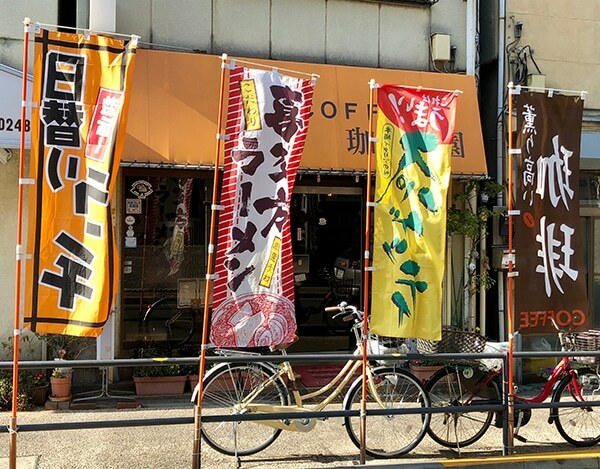 Kohien is difficult to miss with its distinctive orange awning. Not to mention the banners flapping in the breeze. Botan is the Japanese name for a species of peony; a fitting appellation for such a calm and comfortable, unhurried kind of area. Kohien is like that too; a place to linger over a late lunch or a coffee break, chatting with friends, family, or colleagues, or just reading a book and relaxing. If you’re in the area and fancy some hearty, traditional fare or a good, strong cup of coffee, why not drop in. Your appetite and your wallet will be very pleased you did.